Strobel has a Master of Studies in Law degree from Yale Law School and has been a journalist with the Chicago Tribune and other papers. 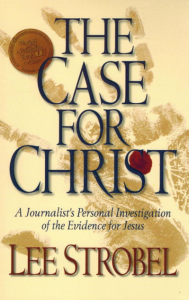 He became a Christian by pursuing the evidence for Christianity in the same way he pursued cases as a journalist. This book takes you on that journey as he interviews scholars about various questions a skeptic would have about Christianity. I especially enjoyed his interview of Edwin Yamauchi at Miami University in Oxford, Ohio because Dr. Yamauchi has been a family friend and fellow professor there with my father for years. It is vital that we link our faith to real evidence of Christ’s advent and the historicity and reliability of the Bible. Without these historical realities, our faith is only existential and no better than any other human-based religious experience.